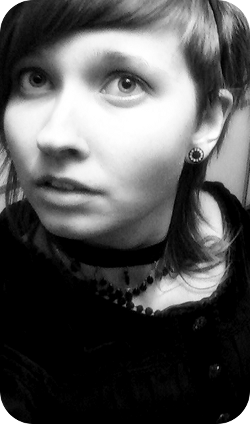 I'm a 18-year-old female student from Finland and belong to the minority of Swedish-speaking Finns. I speak Swedish, Finnish, English and Spanish. I'm pretty tall and I have stretched earlobes. Currently single. I believe in God and consider myself a Christian. I'm a musician (or at least studying to become one) and I play the (classical) accordion, piano and I also sing. My three favorite artists are The Rasmus, Muse and Miyavi but I listen to pretty many bands/artists and also enjoy classical music. I also buy CD's, because I'm old-fashioned as that. My cat, Rasmus, is named after my favorite band of all time. Drawing is fun, but I rarely have time for it. Second-hand shops are looove. I'm quite a geek. I guess people do call me nerdy. What people wouldn't assume about me is that I'm quite a stalker when it comes to people that really interest me. I'm also seriously addicted to Internet, and sometimes I stay awake just to surf around and/or chat. Quite embarrassing. I'm especially addicted to tumblr. Also former Gaia-addict. I do get obsessed with things easily. It can be anything, really. Oh, and when it comes to love, I won't give up until I know it's over for sure. Mostly, it's a bad thing. Postponing stuff is another bad habit of mine. But I don't smoke, don't drink and wouldn't even consider doing drugs either for that matter. The three most gorgeous celebrities are in my opinion Taylor Lautner, Rupert Grint and Andrej Pejic. Andrgynous people are seriously cool. I love the Japanese culture and would like to visit Japan one day. I read manga and my favorite is probably Death Note. My favourite mangakas are Kaori Yuki and Yuu Watase. I also love Hello Kitty and collect all sorts of Hello Kitty-stuff. I fancy unique clothes and Japanese street fashion and Gothic fashion in particular. I love horror books and other books with a dark twist. Dancer in the Dark may be the best movie ever made. Buffy the Vampire Slayer and Angel are both lovely TV-series. Yeah, I'm a pretty random person overall - deal with it.